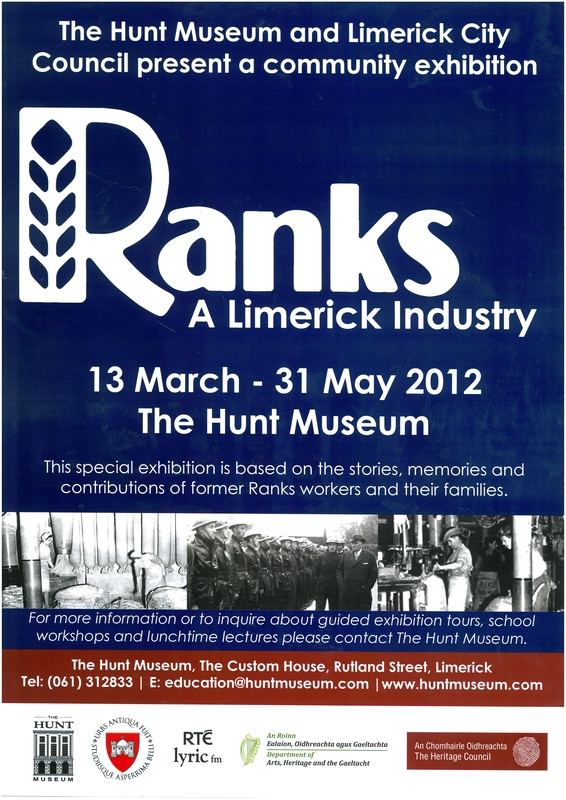 The Limerick City Archives in collaboration with the Hunt Museum has launched a unique exhibition this evening (Tuesday) on the former Ranks Flour Mills titled Ranks A Limerick Industry. This exhibition is a collaboration between Limerick City Archives and the Hunt Museum and is based on the stories, memories and contributions of former Ranks workers and their families. Ranks Flour Mills and grain ships were a crucial part of Limerick life over a span of several decades and it’s legacy provides an excellent example of life and work in Limerick’s recent past. Through interpretative panels, installations, photographs, documents, industrial equipment and memorabilia the story of the working and social life of the Ranks workers is told. The exhibition will run from 13th March – 31st May 2012 at the Hunt Museum on Rutland St. The acquisition of the Limerick Mills by Ranks in 1930 was hugely controversial as Ranks was a British company. However the company grew to the biggest or second biggest flour mill in the state during the Emergency. The mill gained further profitability during the 1960s but in the 1970s the company began to lose market share as Ireland’s accession to the EEC opened up the Irish flour market to cheap imports. Rank eventually closed in 1983. An Oral History Project was organised with the assistance of Mary Immaculate College, staff and students. Through a series of interviews Limerick City Council sought to record the experiences of those employed by Ranks. Ranks reached into every home in Ireland with its products and advertisements. Its marketing strategy and brand awareness made it a recognisable household name. Traditionally Ranks was regarded as a good place to work, one that paid good wages, even contractors or casual workers were relatively well paid. From an early date the Shannon Mills offered their employees benefits that few other workers locally or nationally received including the introduction of a pension scheme in 1947. Future plans for the Ranks story are already in place. The City’s Archives commitment is to not just to record and preserve the people’s history but to bring our heritage to as wide an audience as possible. Alongside the publication of a book- the archives are opening a website dedicated to Ranks history and in co-operation with the Hunt Museum will host an exhibition dedicated to the Limerick Mills. For more information or to enquire about guided exhibition tours, school workshops and lunchtime lectures please contact The Hunt Museum contact the Hunt Museum on +353 61 312833. Yet another busy week and here is a round-up of some goings on at home and abroad that came across the desk of Staged Reaction in the past week. Two major exhibitions and archive events are taking place in Limerick. Photographs taken by Franz Sebastian Haselbeck, which went on display at the Museum Hunt include pictures of Home Rule meetings, farmers’ demonstrations and meetings of volunteers leading up to the War of Independence. Next week is Research Week at NUI Galway. Numerous events are taking place to mark this new event to promote new digital research resources and research and archive collection held by the NUIG James Hardiman Library and Archives. ARAN and RIAN are programmes that allow access to research at NUI Galway and a single portal for national research containing resources from the seven Irish universities and DIT. A series of talks and seminars are planned to help you maximise your research across all disciplines. A letter to The Irish Times this week highlighted the plight of the former residents of the Bethany Houses who suffered in these homes and suffered in their lives outside the homes. Exempt, like the Magdalene’s, from the 2002 Redress Board, a new resurgent call for all complete archives and records of these institutions and people be made available to scrutiny and research. Finally, a national broadcaster has recently used a song as a backing track on a programme advertisement. The 1970 track, The Revolution will not be Televised by Gill Scott Heron is an aptly timed use of a powerful call to a people to stand up and be heard. An anthem certainly for our time and certainly worth a listen.